Please click on the PDF for system inventory and options. 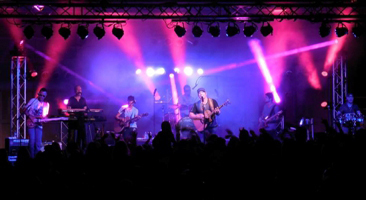 We provide professional concert lighting production that combines all of the key aspects that you want to see at any show. We utilize full size professional LED Par fixtures not the cheesy DJ models, in addition most stages begin with 8 wash and 8 profile moving lights, 6-8 source four leko specials downstage to provide stable white front lighting for each performer, crowd blinders, 3 banks of ACLs upstage, strobes lights and of course haze or smoke so you can see all the beams in action. We can fly off Genie towers if there are no load baring pic points in the venue, or chain motors, if there are. 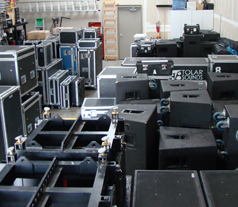 Or we can design and assemble an epic ground package with numerous different truss structures on stage to create a unique and impressive final product. Our LDs know how to program an amazing show and we utilize Avolites and Grand MA for our control platforms for every stage lighting service. Our dance floor lights are an affordable and a very cool addition to any wedding, charity or corporate event. No cheesy DJ lights here even for a high school dance. 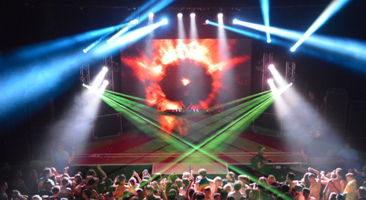 We bring the real deal moving effects that are synced to the beat and aligned to each other, combine them with interesting truss structures, haze and sometimes even a large mirror ball or LED panels to create a truly custom high end night club feel that will impress even the most pompous of players. 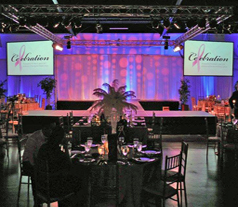 Hiring our event lighting service to create a club level dance floor look is a very affordable addition to any event. 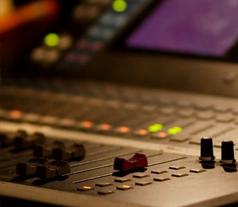 We can set these up quickly and have solutions that do not require an LD to have to be on hand running the lights during the event, which saves you, the client, money. 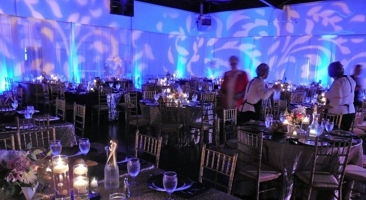 Transforming a dingy plain rental venue into a magical experience requires the use of very creative lighting. 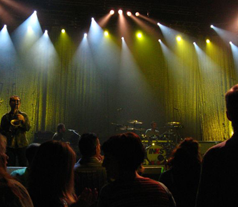 Decorative event lighting services are a real passion of ours and we’ve come to realize that we have a legitimate talent for this. Clients say things like, “Genius”, “Stunning” and “I can;t stop looking at it” or ” you blew my mind”. We have a huge inventory of state-of-the-art battery powered, cordless, wirelessly controlled LED lights that allow us to paint your room and light ever focal point quickly and effectively without having to run a single cable. Then we add texture, shape and content using gobos and leko lighting fixtures. These include breakup patterns, theme images, foliage and shapes and even your company logo. We have ideas to contribute if you are open minded and are constantly trying to outdo our own creations from the past.